Check out our FAQ section below for more information on Ever After Entertainment. Contact us over the phone and we'll help you find the answer you need. Don't see what you need here? Send us a message and we'll get back to you as soon as possible. Ever After Entertainment is more than happy to attend any party venue. Whether you chose to host your party at your home, community centre, play house or any other venue, our characters will be sure to make it a magical experience. Can I host my party outside? While we do realize that you may wish to hold your party outdoors in the warm summer months, we do ask that the party take place indoors in order to ensure your best party experience. We suggest hosting your party outdoors and bringing your guests indoors for the character portion of the party. How much space is required for the party? Our parties require a space large enough for your guests to sit comfortably to enjoy the performance. For our more active parties we do suggest that the more space available, the better! We suggest moving any tables and chairs out of the way so that all the guests can have fun and participate. Do we need to provide anything for the performer at the party? Our princess performer will require a chair to sit on and a hard surface or table close by for their party supplies. Our Star Warriors & Superheroes may also need a space to change. We also ask that there be a standard electrical outlet close by & a parking space reserved for the performer. We kindly ask that the children refrain from eating or drinking while the performer is entertaining your party. Our parties are best suited for 12 and under children! Our princess parties & superhero parties can accommodate up to 25 children & our Star Warrior party packages do have a limit of 15 participants. We would gladly alter the party schedule to accommodate all guests. We would also be happy to add more time to your party at an additional fee. How much in advance should I book my party? We do suggest booking your party at least 4-6 weeks in advance in order to ensure you receive your desired character, date and time. We do try to accommodate later bookings however in order to avoid disappointment we suggest booking your party as soon as possible. Do I need to Provide Parking for the Performer? We do kindly ask that you leave a parking spot available for the performer as close as possible to the party. The performer is travelling in an elaborate costume and has lots to carry so the closer the parking spot the better. We do require additional travel fees for parties located outside the Toronto Area, as well as additional fees for late night parties. Please contact Ever After Entertainment for more information about travel fees. What happens if some of my guests arrive late? The performer must begin their party routine at the scheduled time as our performers are very busy and need to attend to their schedule. We suggest calling the party for at least a half hour before the performer arrives in order to ensure that all the guests are in attendance and ready for the performance to begin! Can I request a Cast member? Yes, we always try our best to make sure that you receive a requested performer. All of our cast members are talented performers and will be sure to provide your guests with a magical experience. Ever After Entertainment is more than happy to reschedule your party, however, if you wish to cancel and not reschedule your party, the party deposit is non-refundable. Ever After Entertainment is more than happy to reschedule your party! 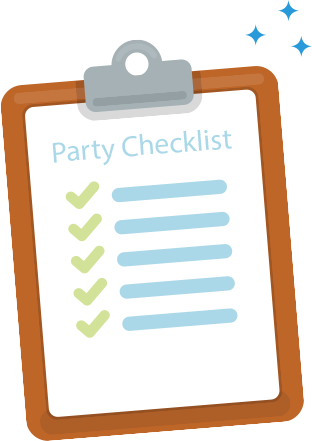 Once your party deposit has been received and your party is booked, it is non-refundable. If you would like to reschedule your party date or time, and it is less than 14 days before your booked date, there will be a rebooking fee of $25. Ever After Entertainment has made it our priority to reserve a specific performer for your booked party date & time, and we greatly appreciate your understanding in this matter. In the event of illness/bad weather/ events beyond our control, Ever After Entertainment reserves the right to reschedule your party. In rare and extreme circumstances, where our performer cannot attend your party/event we will provide your child with a complimentary character party for a mutually agreed upon future date, and fully refund any deposit that has been made. Ever After Entertainment takes pride in its superior customer service and we strive to ensure that all of our customers receive the best in children’s entertainment. Ever After Entertainment uses make-up products on the children, and separate swaps and cotton balls for each child’s make-up application, however in the event that a child reacts to the make-up, Ever After Entertainment and its performers are not held responsible. We will gladly provide tattoos, nail polish or another activity in place of the “Magical Makeover” portion of the party at the customer’s request. If your child or a child at the party has allergies or sensitivities, please notify the performer before the makeup is applied and we will gladly provide you with an alternative.The customer agrees that Ever After Entertainment is not responsible for severe weather or acts of God that may cause the cancellation of our Performer attending your party.